Regular inserts are made from 100% recyclable SBS outside and kraft inside. Inserts can be reversible. We know you put a lot of time and effort into making your cupcakes special. Our cupcake holders are custom designed to fit our cupcake boxes perfectly. They protect your creation without slipping or sliding. We have standard and modular inserts for mini, regular and jumbo cupcakes. Our cupcake stands are available in silver, gold, white and black. Ships flat and must be assembled. Contains embossed foil tiers and cardboard stand..
Tiered cupcake stand made of corrugated board wrapped in embossed foil. Available in silver, gold, white and black. Ships flat and must be assembled. Contains embossed foil tiers and cardboard stand. 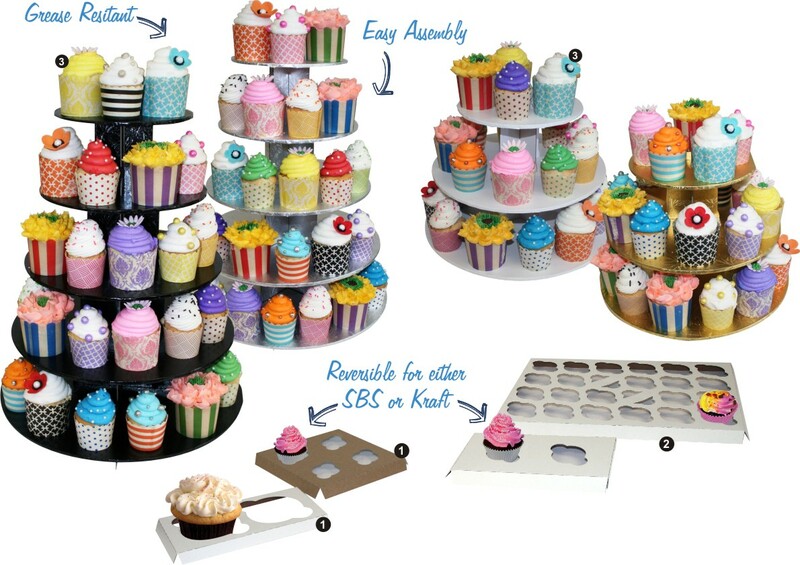 3 Tiered stand can hold approximately 36 cupcakes, 5 tiered stand can hold 66. These inserts are made from solid bleached sulphate (SBS) and are only made for regular size cupcakes only. Specific boxes can only be used with the 2-count or 6-count cupcake inserts for our modular system, see boxes on page on page 12.
cupcake boxes for the regular inserts.